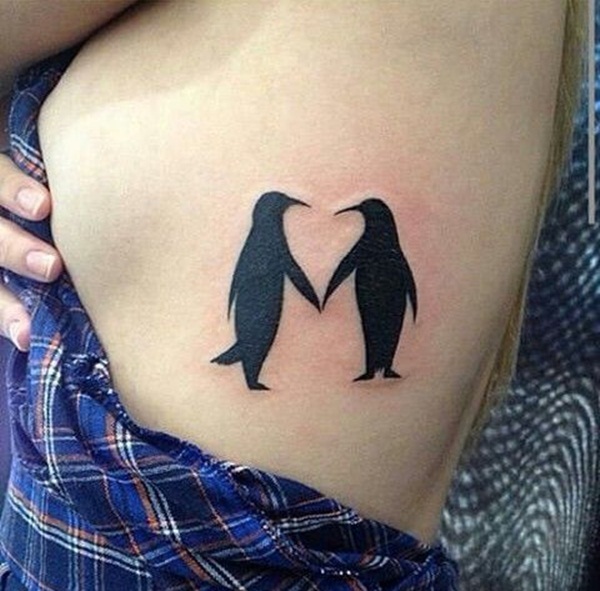 Over the past one hundred years penguins have become inseparable from pop culture. 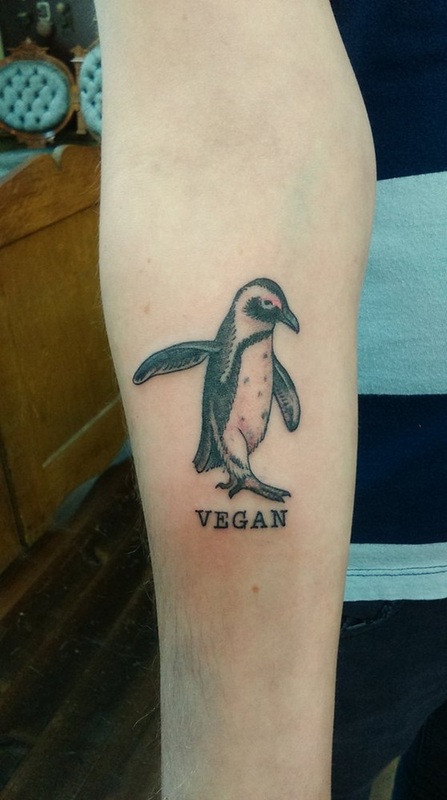 Through movies, TV, and books the penguin has become a beloved animal among children across the world. 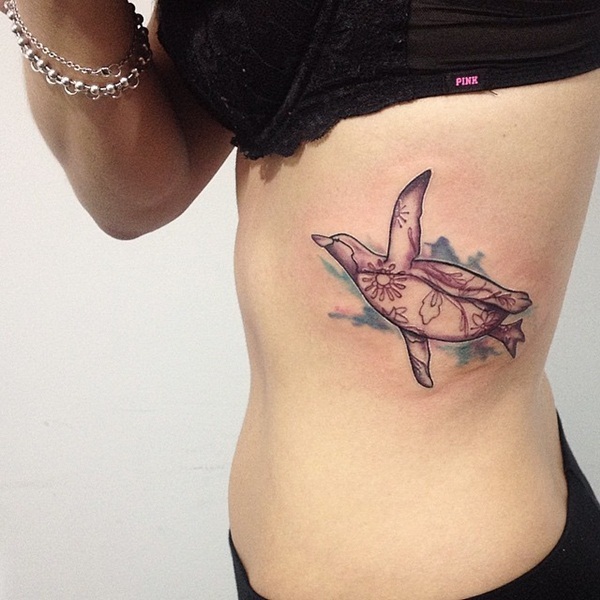 With an immediately recognizable waddle and contrasting coloration the penguin has managed to become an icon for cuteness in the media and as such the amount of penguin tattoos has increased accordingly. 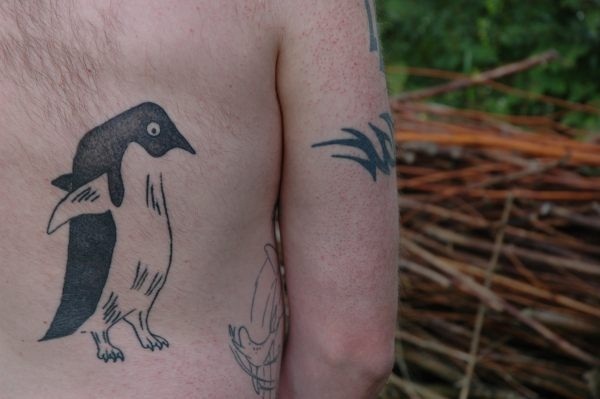 This article presents roughly ninety penguin tattoos for your consideration, so you can decide if the flightless fowl is the right subject for your next trip to the tattoo parlor. 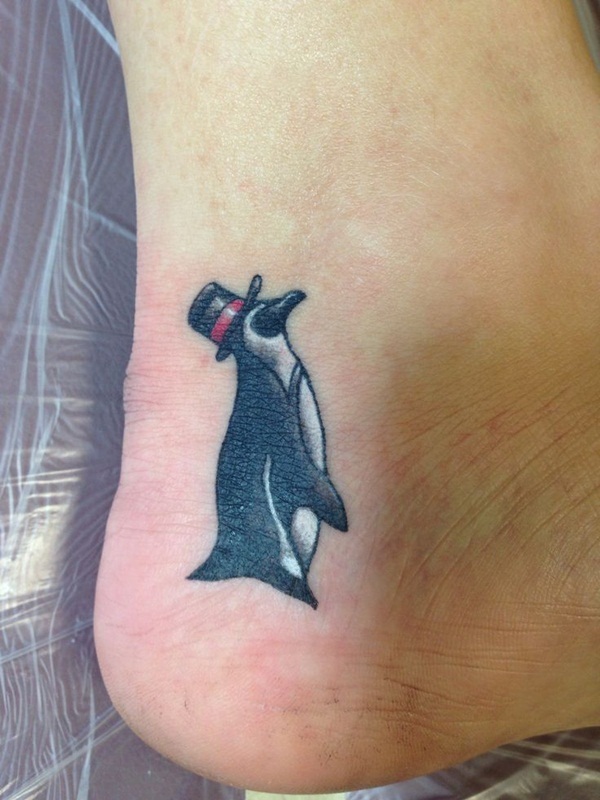 This tattoo renders a penguin wearing a top hat with a red band. The piece is located on the inside of the wearer’s left foot just in front of the heel. 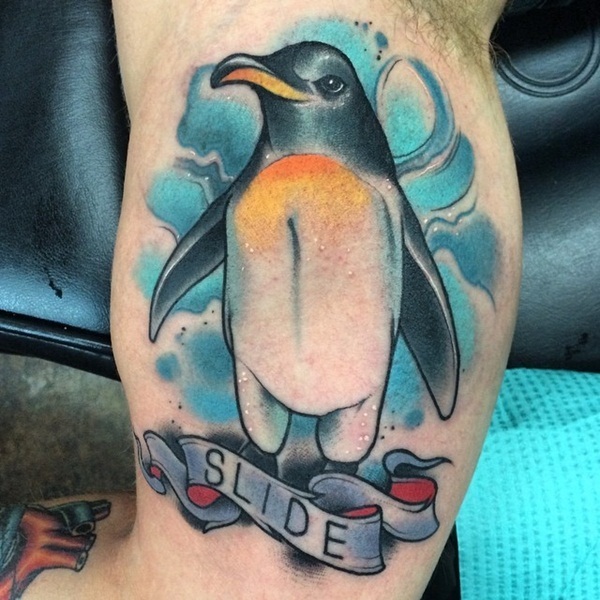 A colorful depiction of a penguin wearing goggles and a scarf while riding a snowboard is illustrated on the wearer’s left thigh. The Emperor Penguin, native to Antarctica, holds the distinction of being the world’s heaviest and tallest species of penguin. 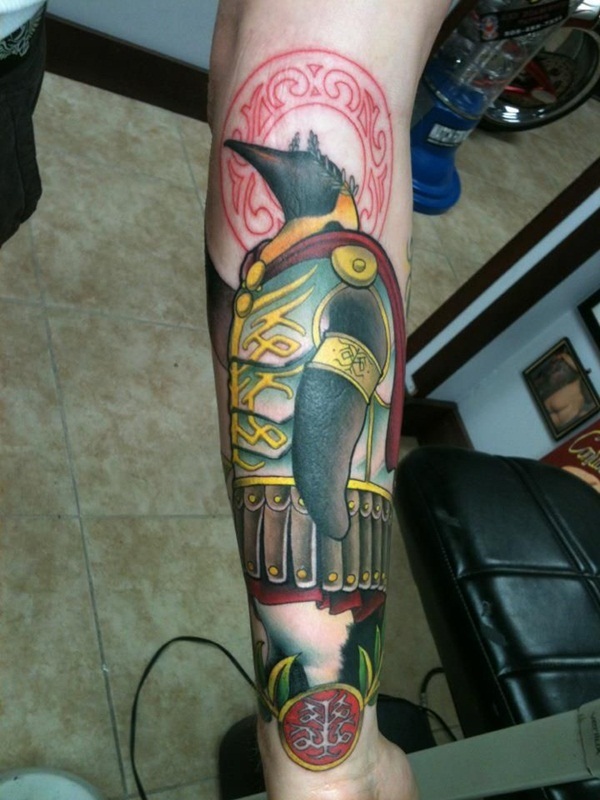 This pun in the form of a tattoo renders an “Emperor” Penguin clad in armor and a wreath reminiscent of Roman royalty. 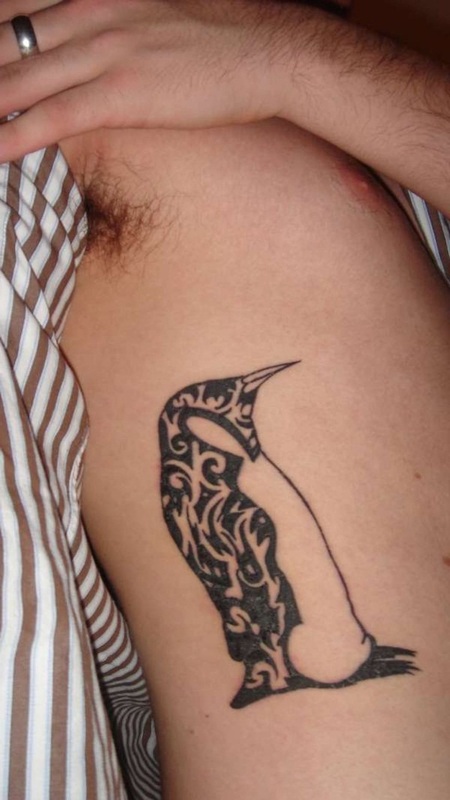 A pair of black penguin silhouettes are depicted on the left side of the wearer’s torso. 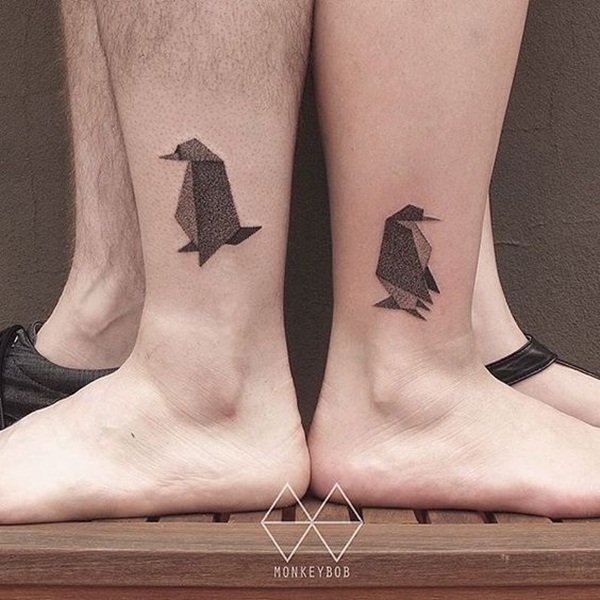 The flippers of the penguins are touching and the beaks are close enough to loosely form the shape of a heart between the two birds. 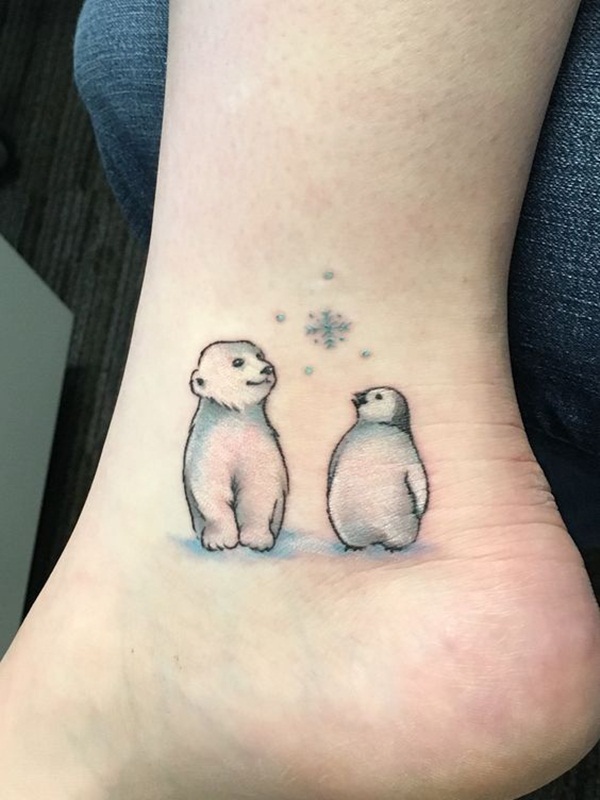 This adorable illustration depicts a baby penguin and baby polar bear marveling at a snowflake falling between them. 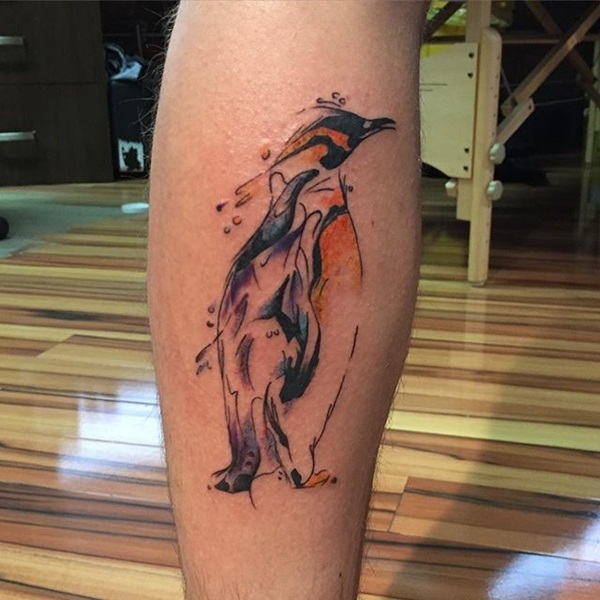 Purple, yellow, blue, and black ink is used to create the image of a Macaroni Penguin in a fragmented, abstract style. 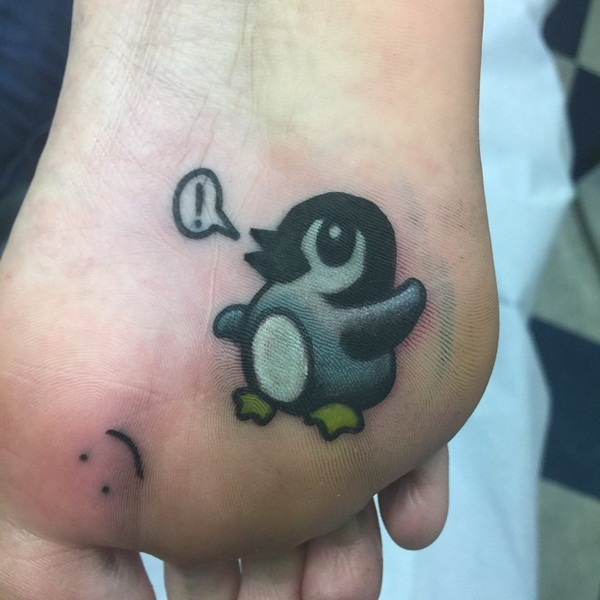 A tiny, black, white, and gray penguin making an exclamation is pictured on the bottom of the wearer’s foot in this tattoo. 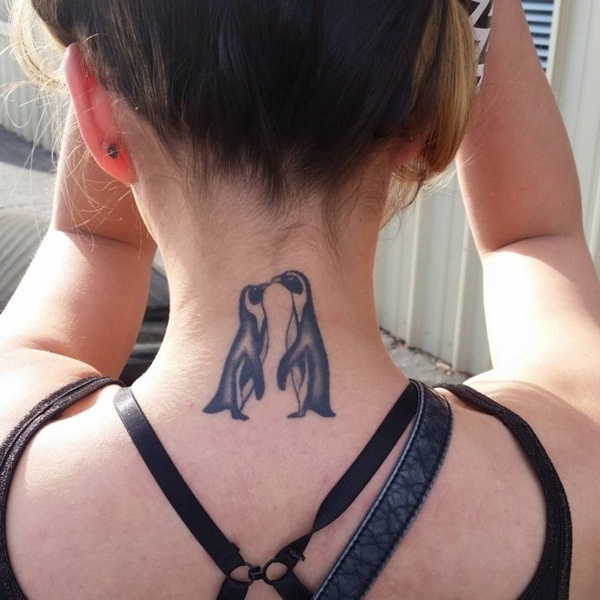 A pair of kissing penguins are rendered on the back of the wearer’s neck in black and gray ink. 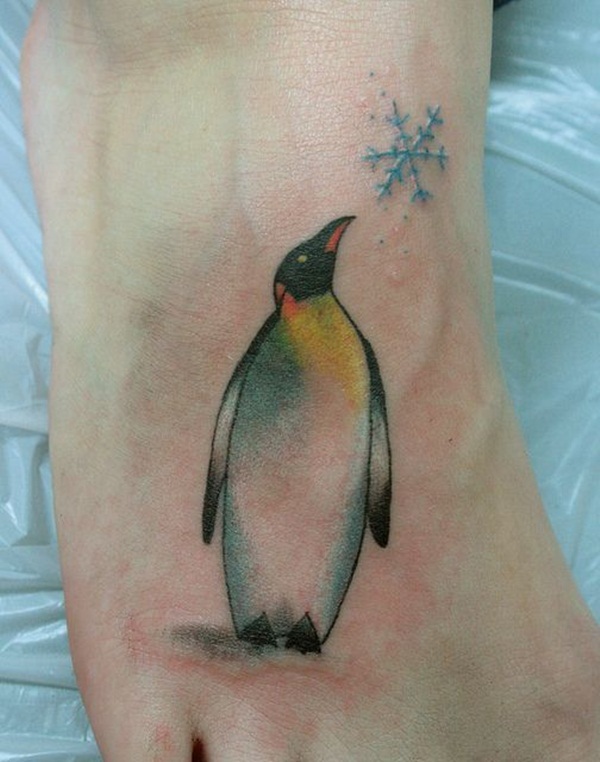 A simple rendering of a penguin looking at a snowflake is accented with a touch of yellow ink in this tattoo rendered on top of the wearer’s foot. 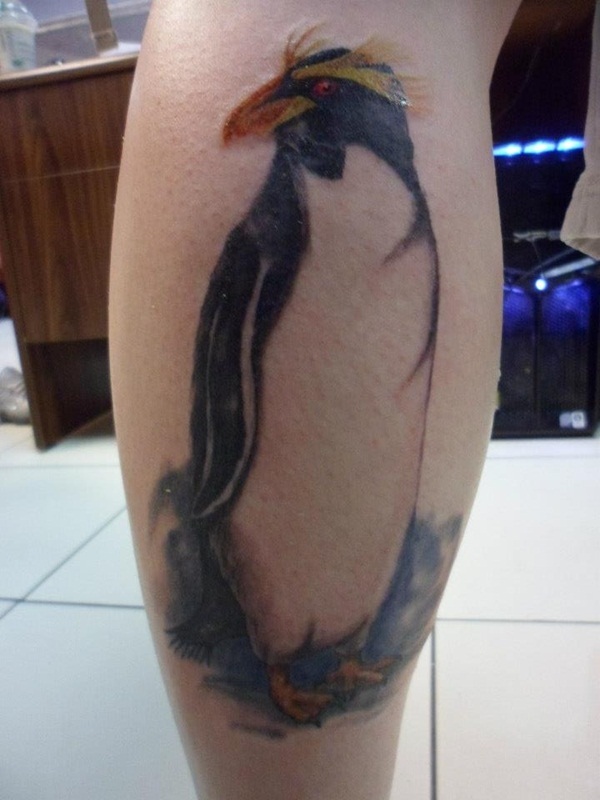 A life-like portrait of a Macaroni Penguin is pictured on the side of the wearer’s calf in this color tattoo. 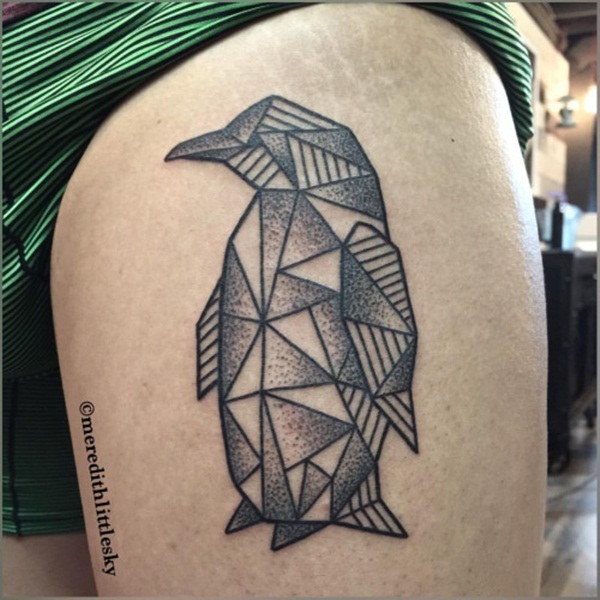 Geometric shapes and pointillist techniques are used to create the images of penguins seen in this photo. 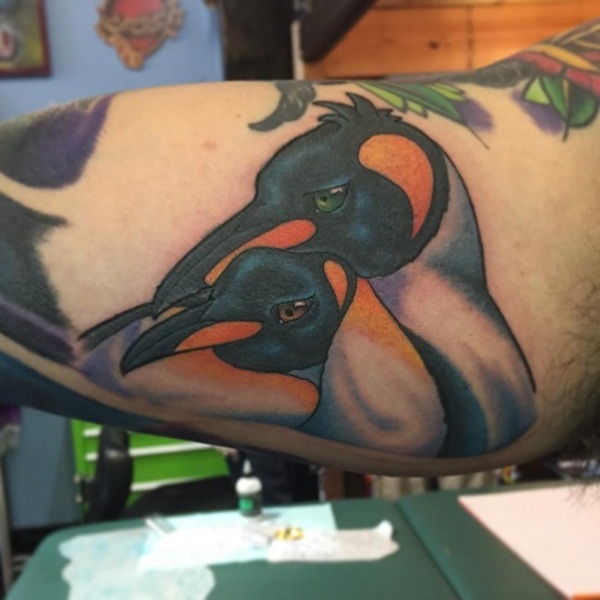 A pair of penguins embrace in the middle of a realistic arctic landscape in this full color tattoo located on the wearer’s upper arm. 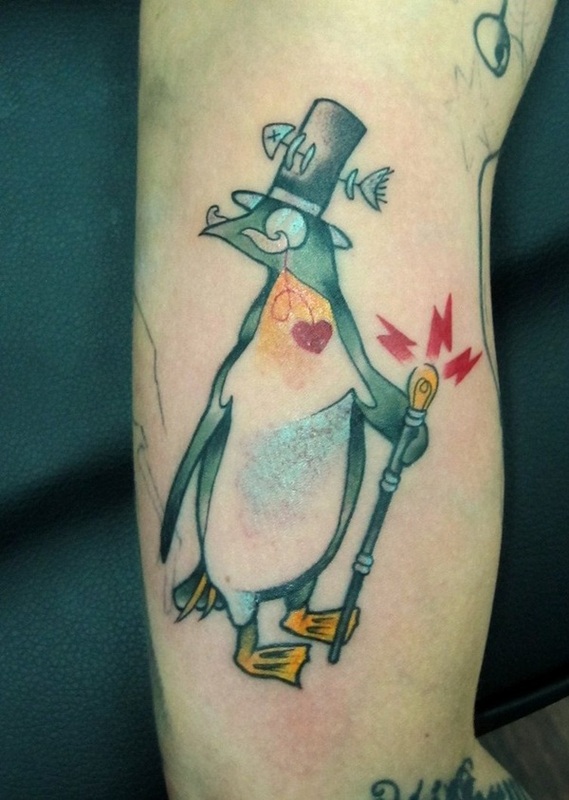 Blue and yellow inks add a flourish to this image depicting a tuxedo wearing penguin wielding a cane. 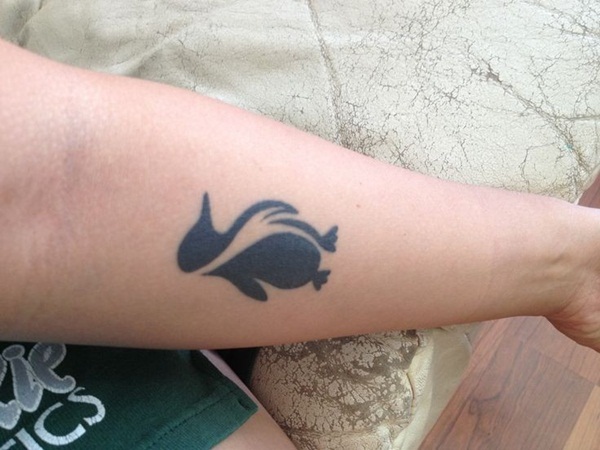 This tattoo, located on the wearer’s forearm, features a stylized rendering of a penguin in dark black ink. 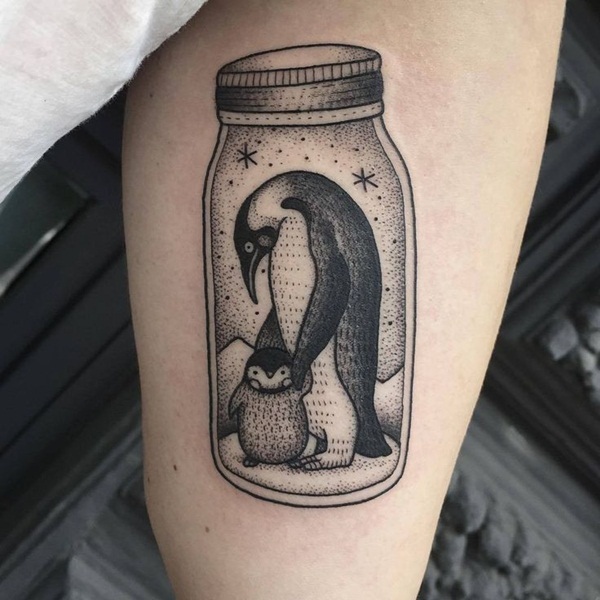 This black and gray tattoo pictures a pair of penguins within a jar. 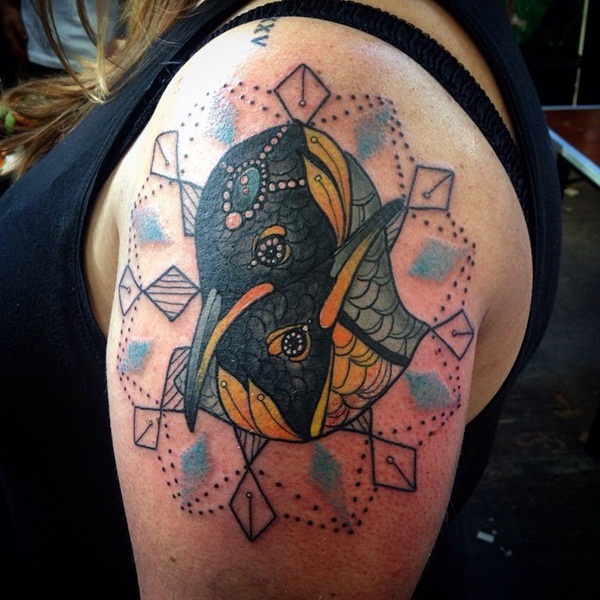 Series of dots and small lines are used in lieu of traditional shading and create a unique aesthetic. 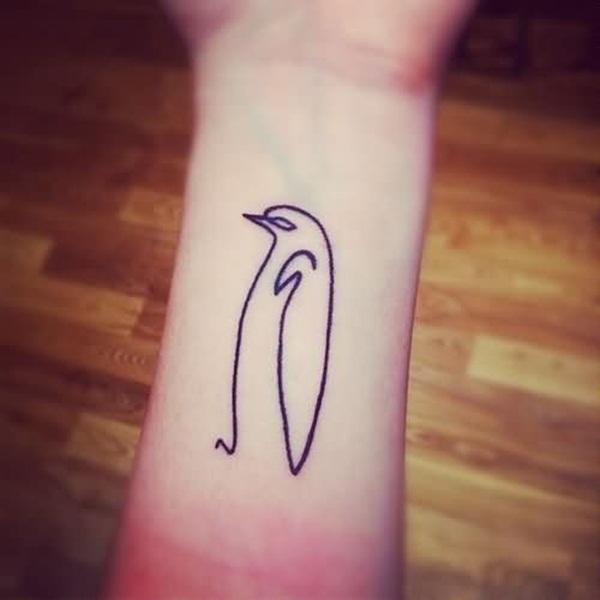 A small, tribal style penguin is rendered on the wearer’s wrist in black ink. This remarkable piece features a penguin standing above a banner reading, “Slide.” A deliberate use of color adds complexity to the piece without overwhelming the image. 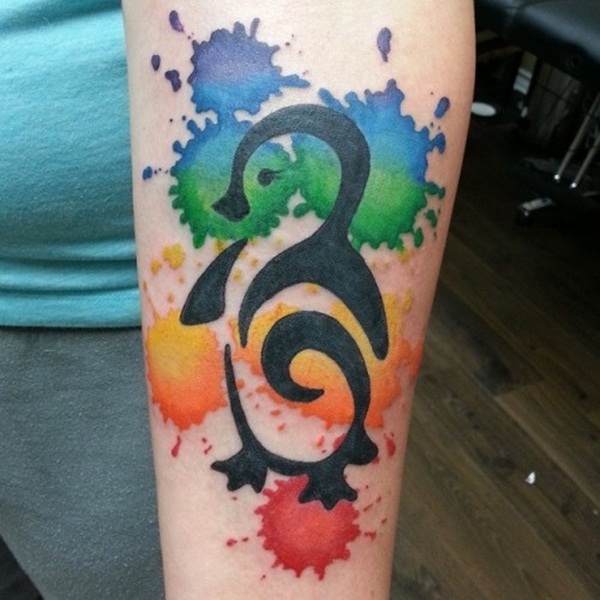 Here we see another example of the tribal penguin, however, this piece is rendered over a series of multicolored watercolor splatters. 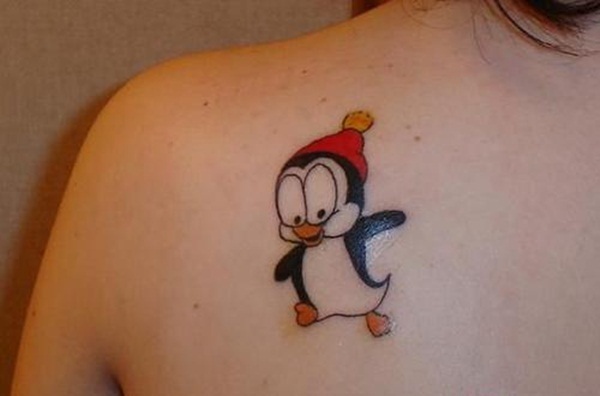 A cartoon style penguin is illustrated wearing a red beanie in this tattoo located on the wearer’s chest. 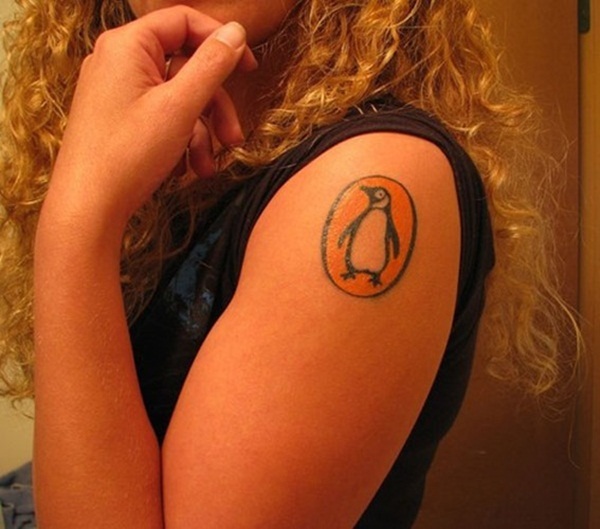 Avid readers will recognize this logo of the prolific American publishing house, Penguin Books, rendered on the wearer’s upper arm. 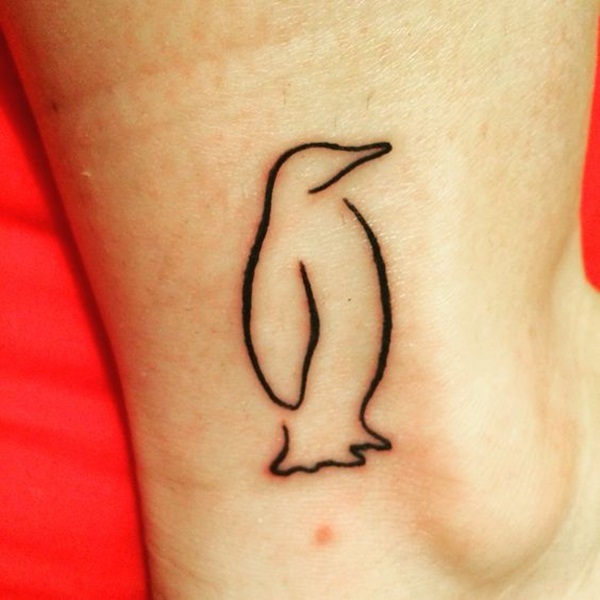 A penguin is created a simple black outline in this tattoo located near the wearer’s ankle. 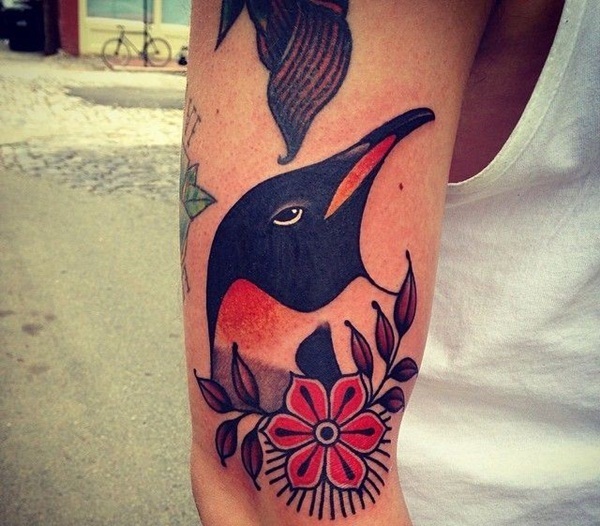 Traditional styling is used to create this tattoo depicting of a penguin’s head accented by a flower. 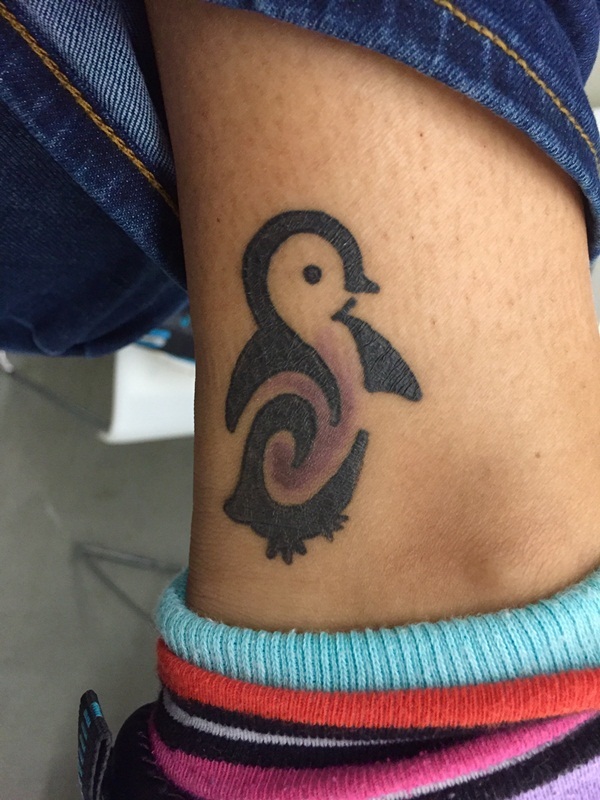 This tattoo, rendered in black and gray ink, depicts a penguin with white eyes standing atop an elaborate geometric shape. 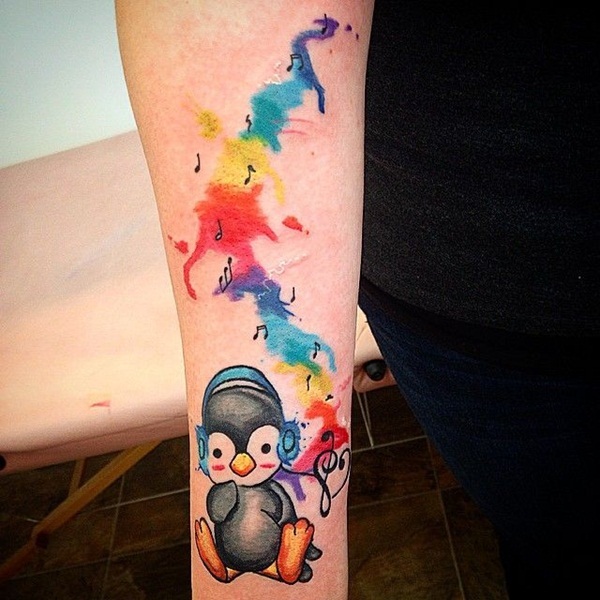 This imaginative tattoo illustrates a seated penguin wearing headphones with a stream of watercolors and musical notes pouring from the earphones. 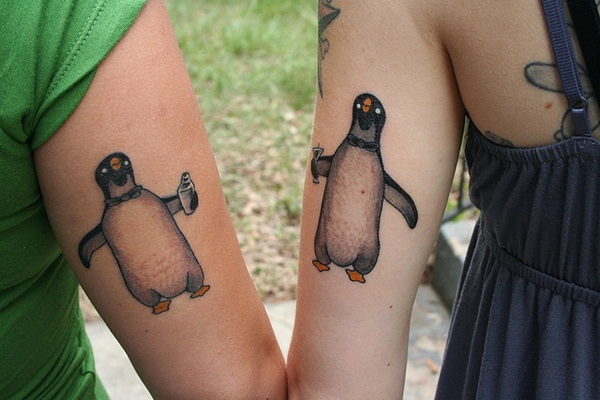 Perfect for penguin lovers and alcoholics. This complimentary pair of penguins are illustrated with one holding a martini shaker and another holding a martini. 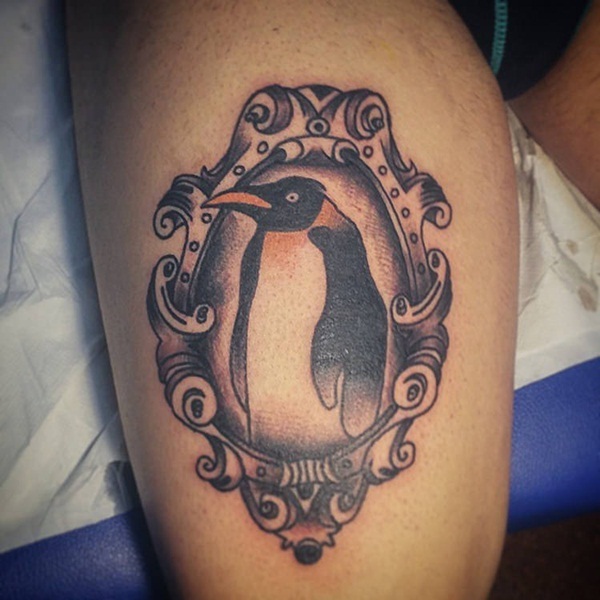 A simple but stylized portrait of a penguin is illustrated within an ornate frame in this tattoo. 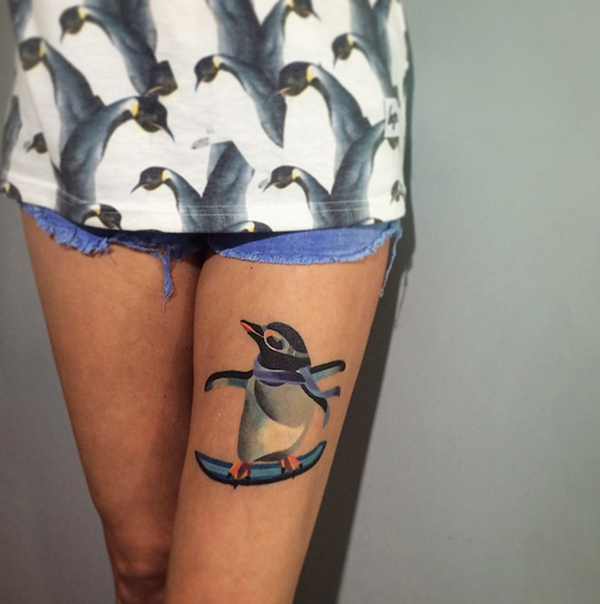 A penguin accented with multiple images is illustrated over a smear of blue watercolors in this tattoo rendered on the wearer’s torso. 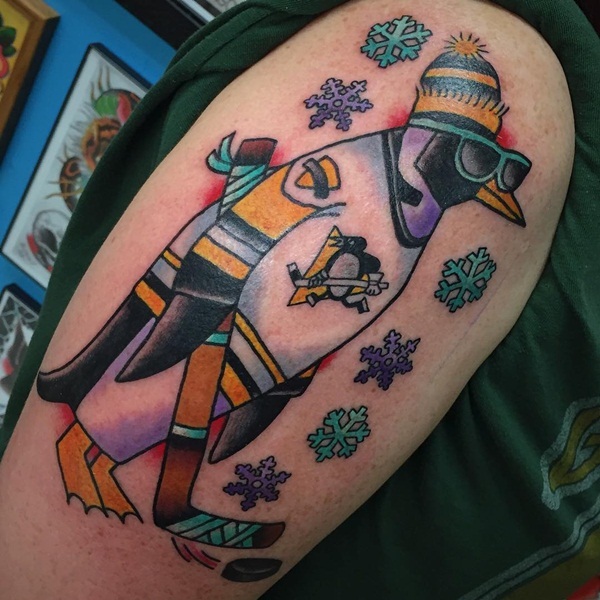 An ode to the Pittsburgh Penguins NHL team, this tattoo features a colorful penguin holding a hockey stick and wearing a Pittsburgh Penguins hockey jersey. 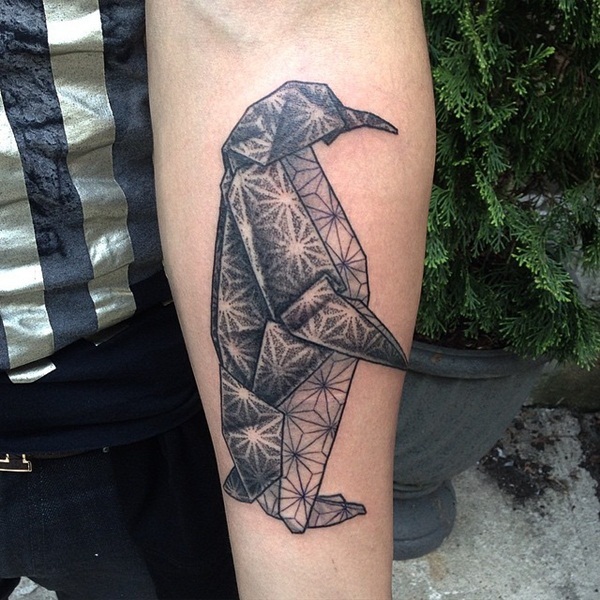 This abstract piece, rendered on the wearer’s forearm, depicts a fragmented penguin in black and gray ink. 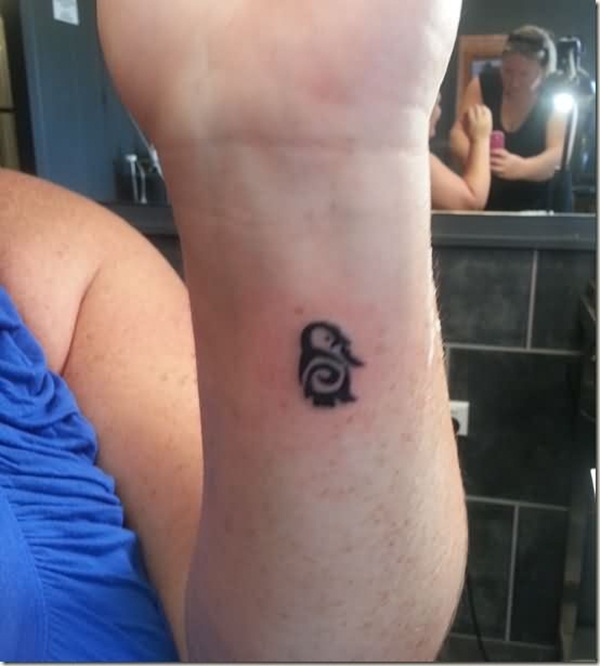 Another rendition of the tribal penguin we’ve seen already, however, this tattoo is set apart from the others by the purple coloration of the swirl. 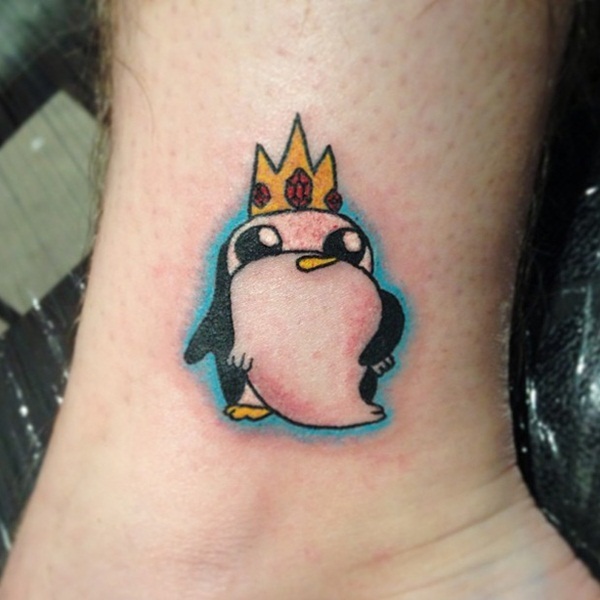 Immediately recognizable to fans of the cartoon, Adventure Time, this tattoo features Gunther wearing the beard and crown of the ice king. 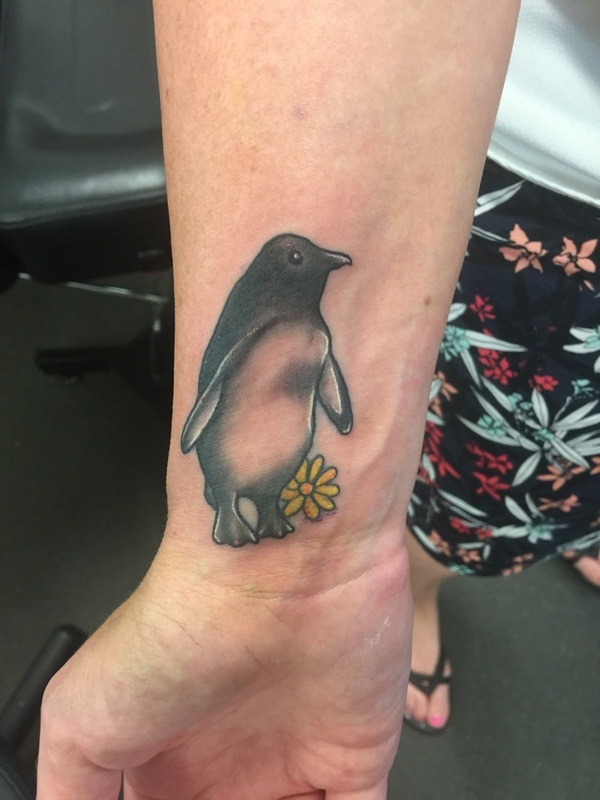 A darkly shaded penguin is accented with a small yellow flower near its feet. 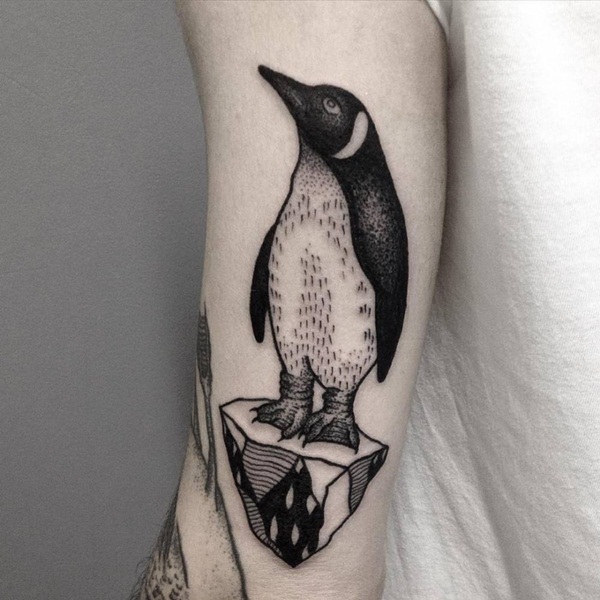 A penguin standing on ice block is rendered looking skyward in this black and gray tattoo. 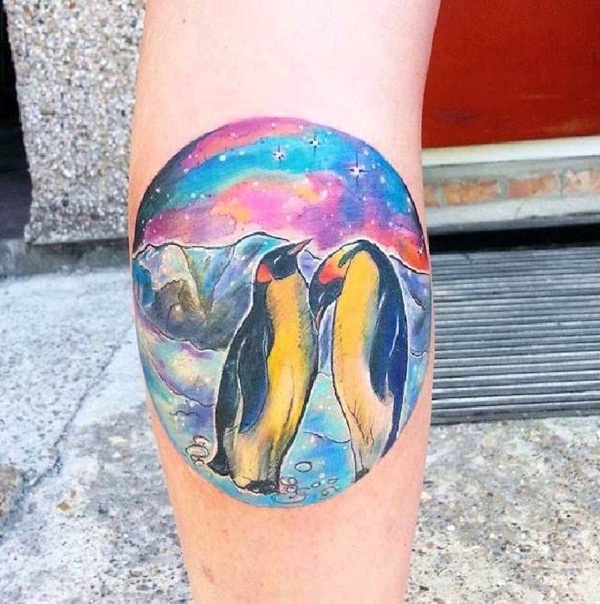 This vibrantly colored tattoo features a pair of penguins standing in front of snowy mountain beneath a multi-colored sky. 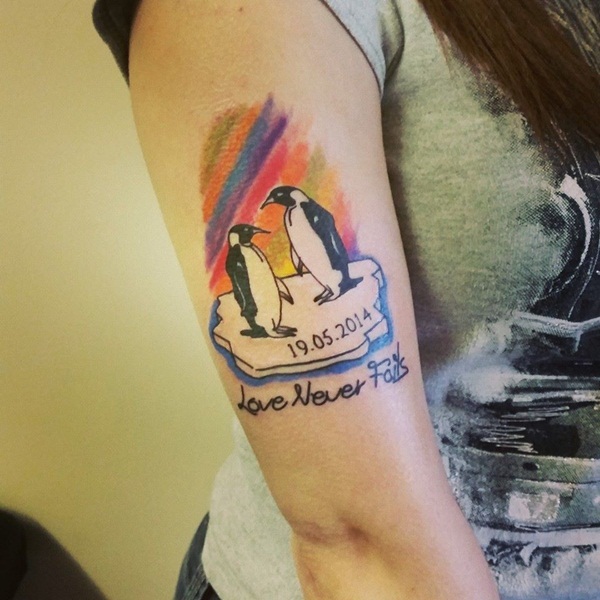 A rainbow background sits behind a pair of penguins atop a glacier reading, “19.05.2014,” with the quote, “Love Never Fails,” reading beneath. 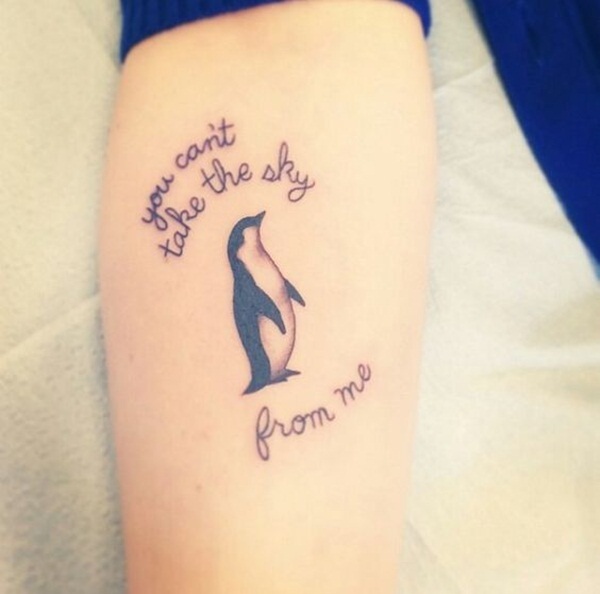 Six people decided this simplified rendition of a penguin would be the perfect physical representation of their friendship. A hyper-stylized cartoon penguin is illustrated wearing a scarf and a purple bow. 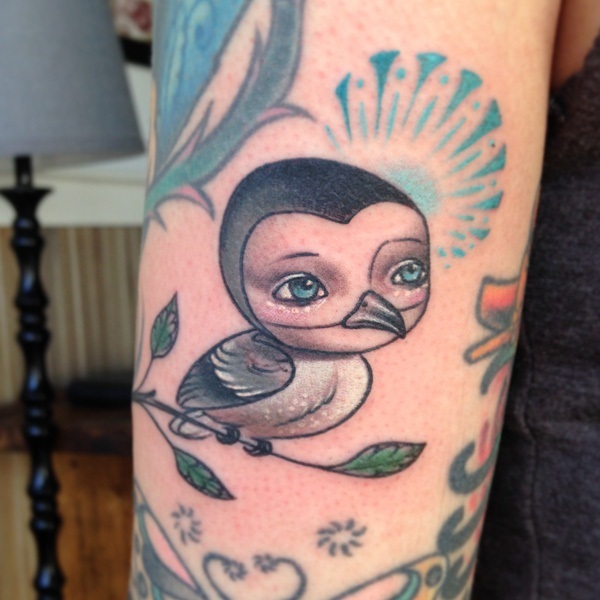 This bird, while not a penguin, has an awkwardly human face and is pictured perched atop a branch. 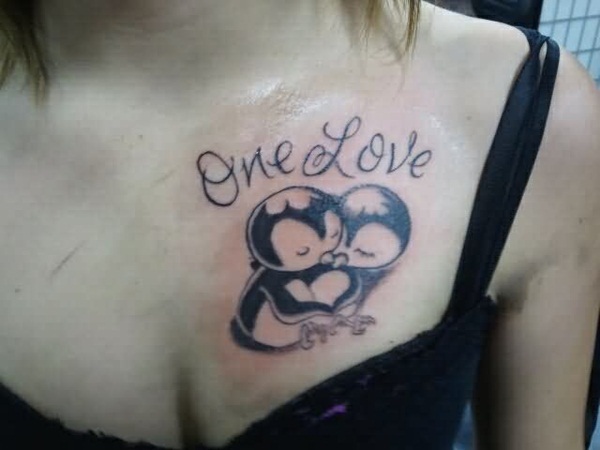 This tattoo, reminiscent of a sketch without all the initial lines erased, is illustrated on the right side of the wearer’s torso. 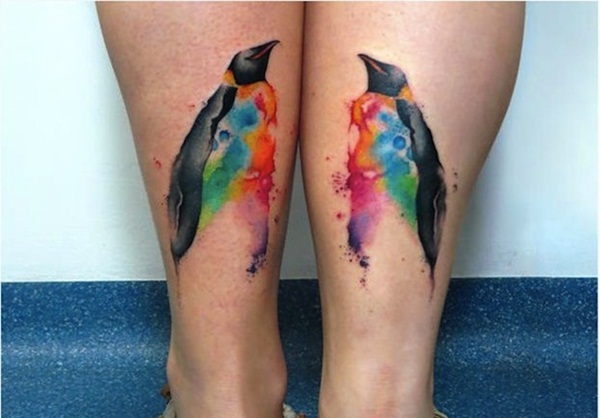 A pair of penguins embellished with watercolors on their stomachs are rendered in this photo. 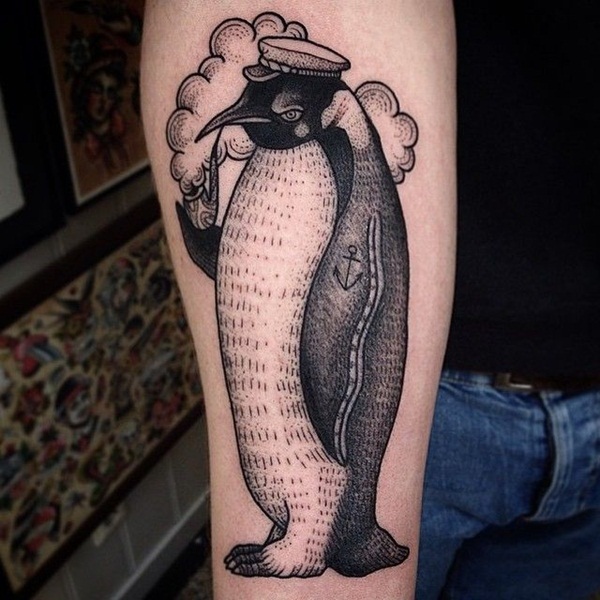 A penguin wearing a sailor’s cap is pictured in a style reminiscent of old scrimshaw on the wearer’s forearm. 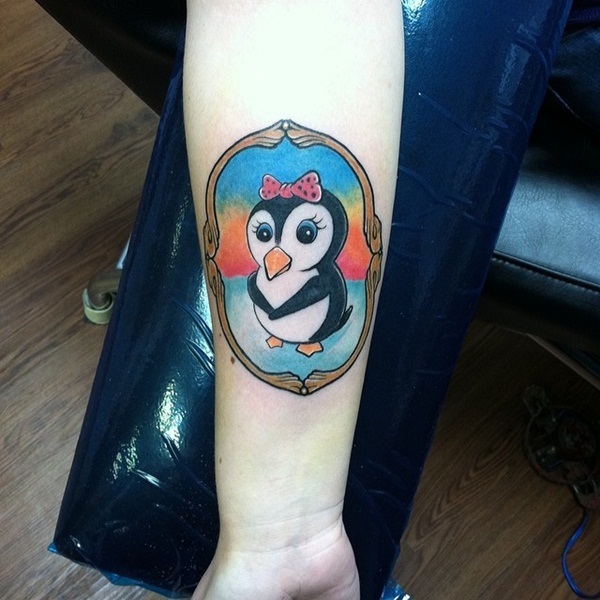 A cartoon style penguin is rendered over a colorful background inside of a picture frame. 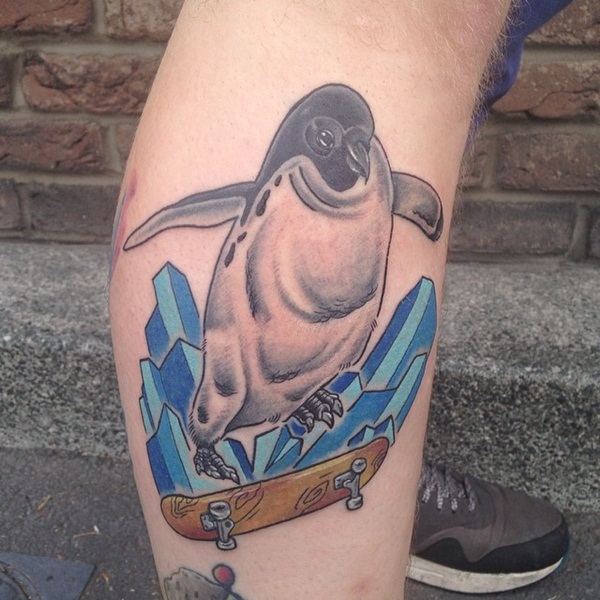 A penguin riding atop ice glaciers on a skateboard is illustrated on the wearer’s forearm. 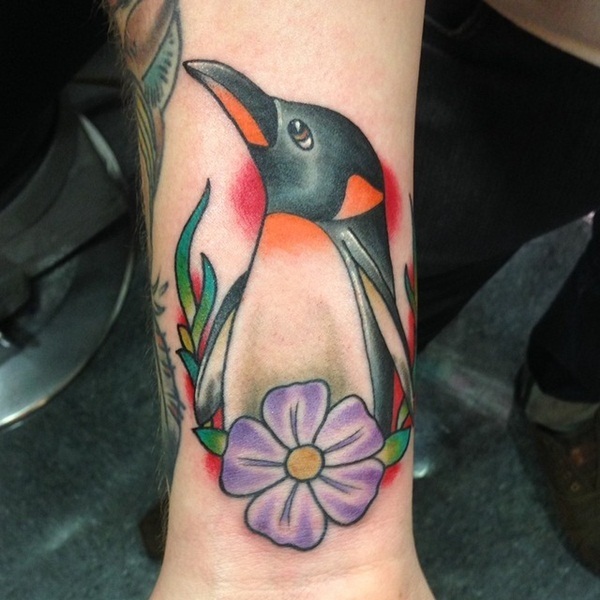 Traditional styling is used to create this tattoo featuring a penguin accompanied by a purple flower. 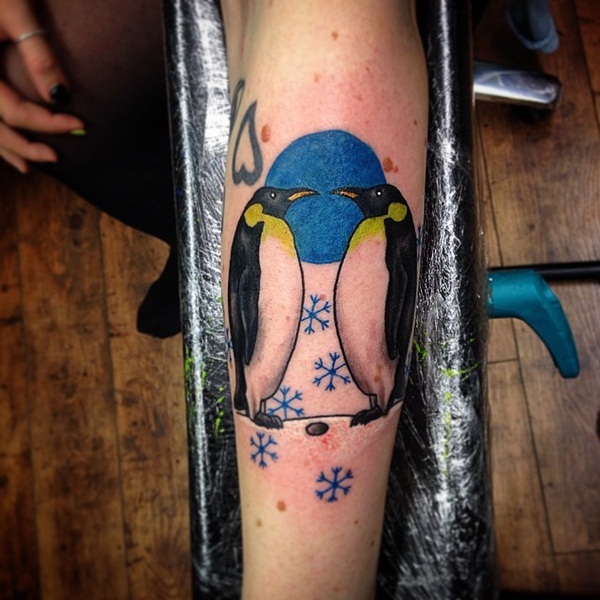 A pair of penguins stand beak to beak while blue snowflakes fall between them. 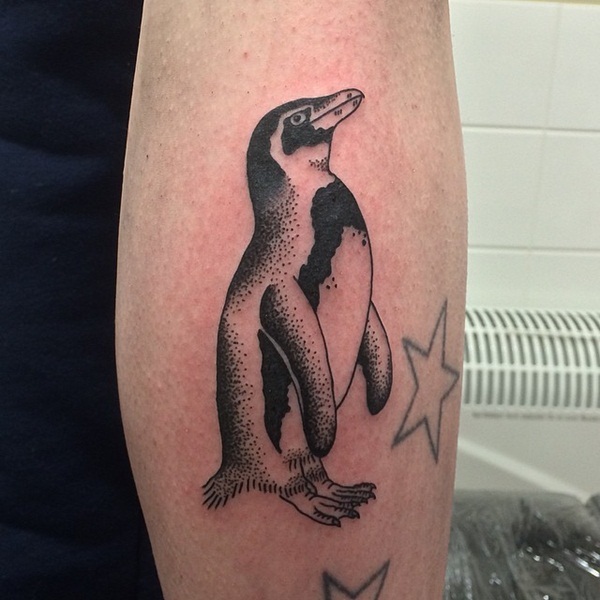 A penguin, created using heavy black coloration is accompanied by a pair of stars in this tattoo. 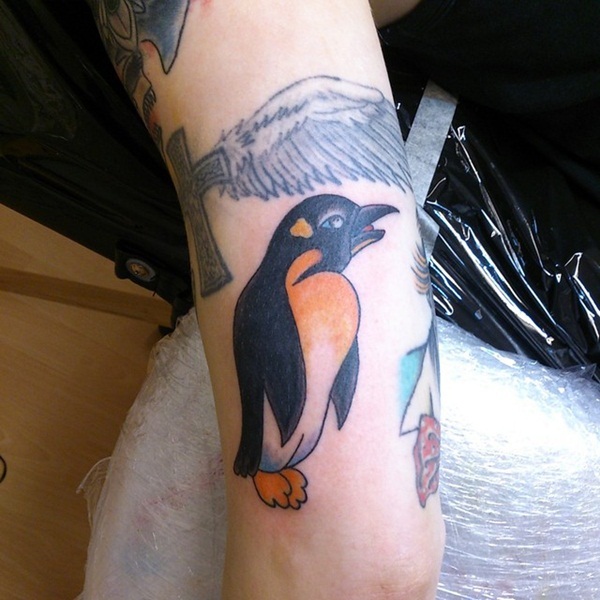 A penguin with a puffed out yellow chest is depicted on the wearer’s forearm. 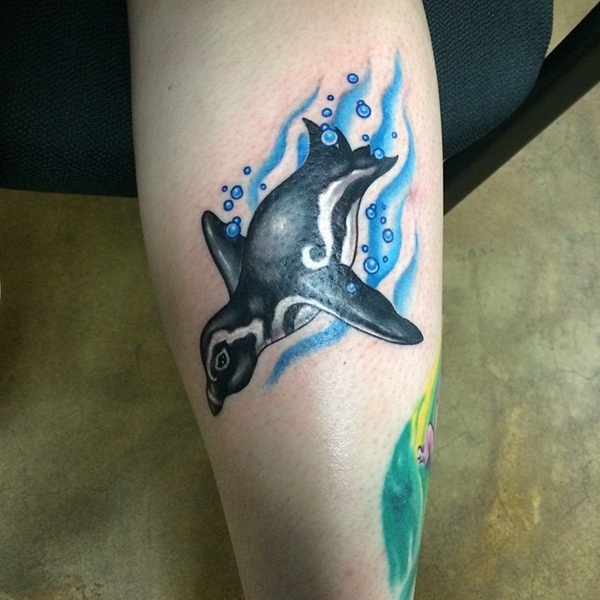 Bubbles swirl around this black and white penguin as it cuts through the water in this tattoo rendered on the wearer’s forearm. A family of penguins is pictured in front of a colorful set of mountains. 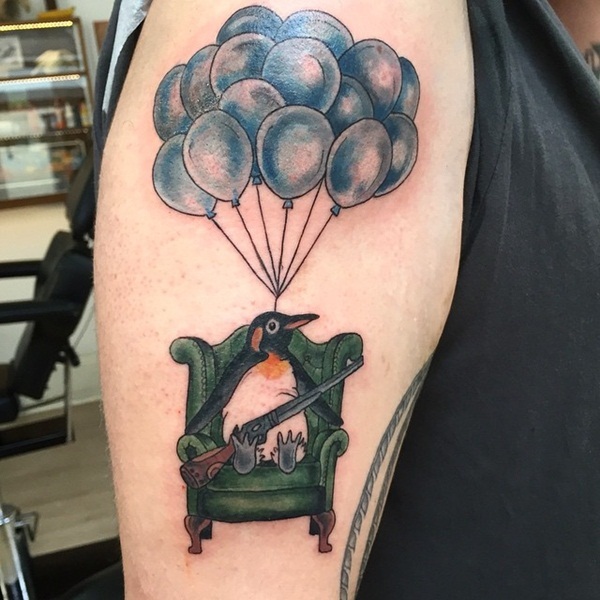 This oddly conceived tattoo features a penguin with a shotgun seated in a chair attached to multiple balloons. A monocled penguin is depicted wearing a top hat while a trio of fish jump out of the water. 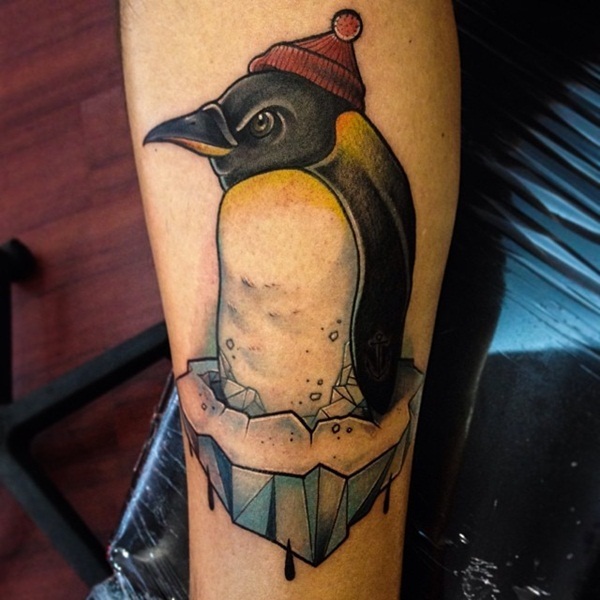 An angry looking penguin bursts through a block of ice while wearing a red beanie in this tattoo. 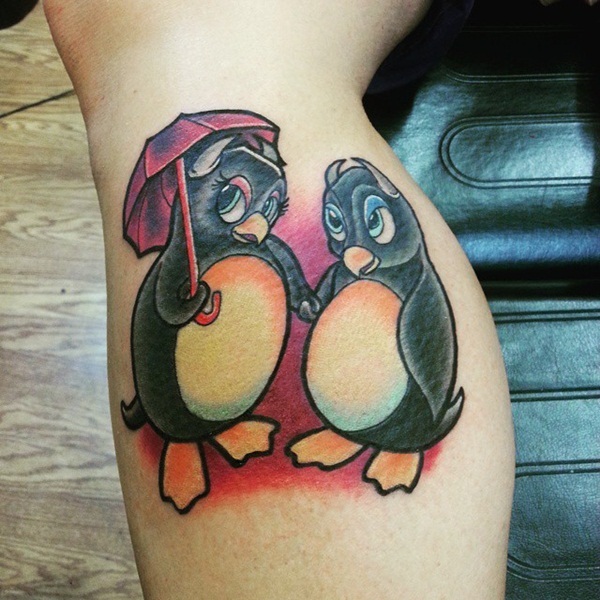 A pair of penguins with devil horns, one of which is holding an umbrella, hold flippers in this cartoon style tattoo. 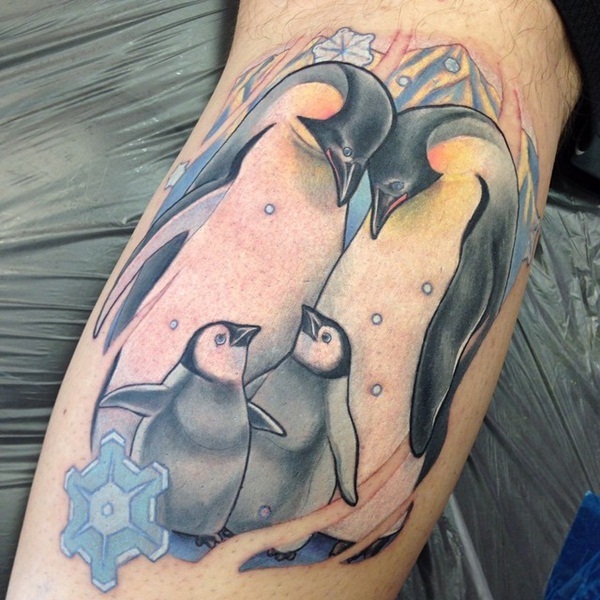 A geometric design surrounds the image of two embracing penguins on the wearer’s upper arm. 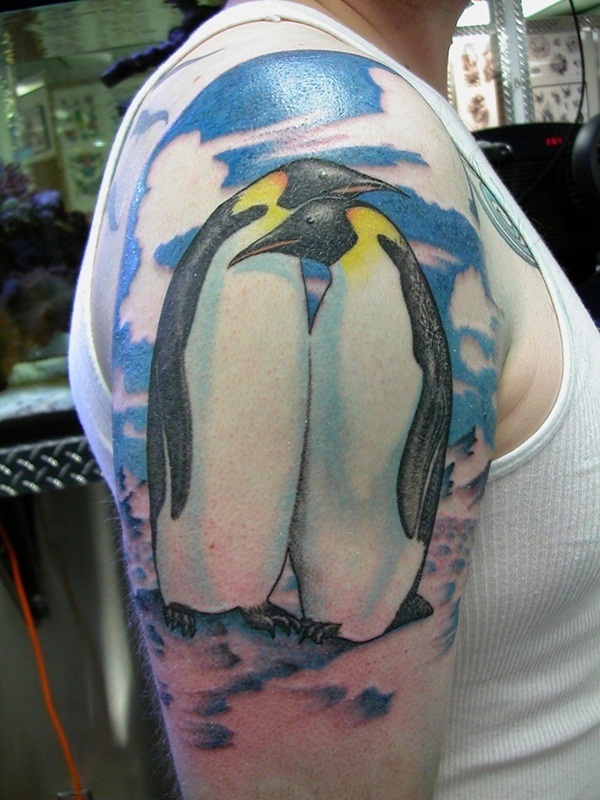 A pair of embracing penguins glare into the distance in this colorful tattoo rendered on the wearer’s upper arm. 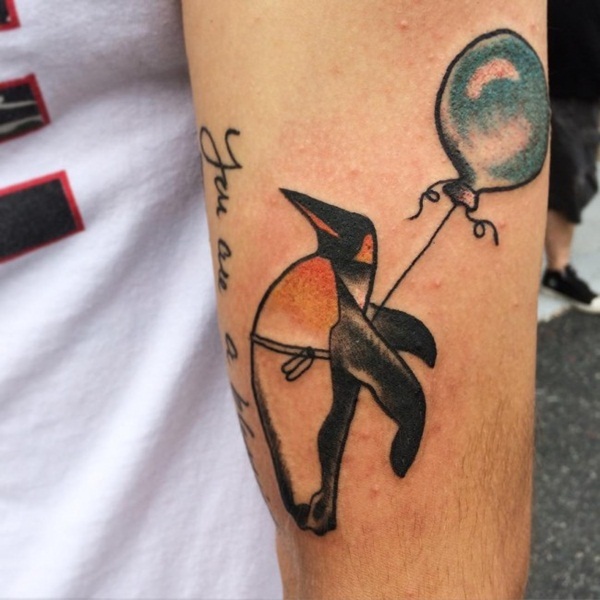 A penguin is pictured with a string wrapped around its chest leading to a blue balloon. 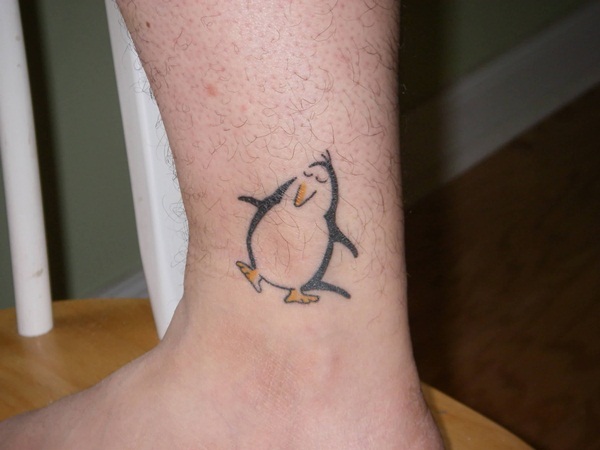 A cartoon style penguin is rendered on the wearer’s leg just above the ankle bone. 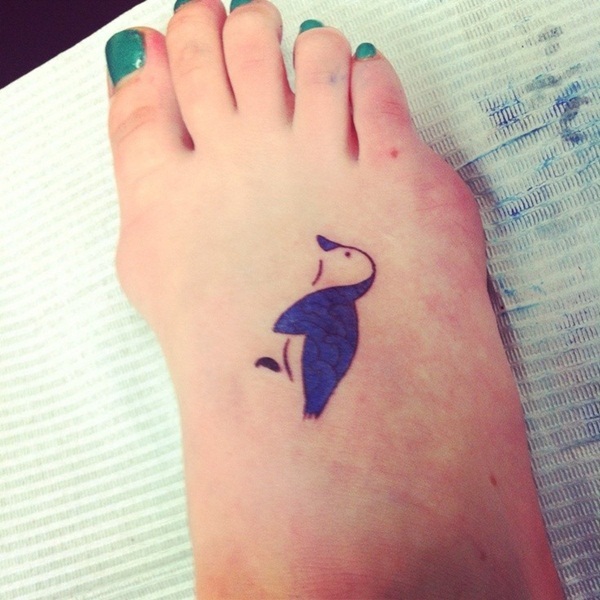 A simple black rendition of a penguin is pictured on top of the wearer’s foot in this tattoo. 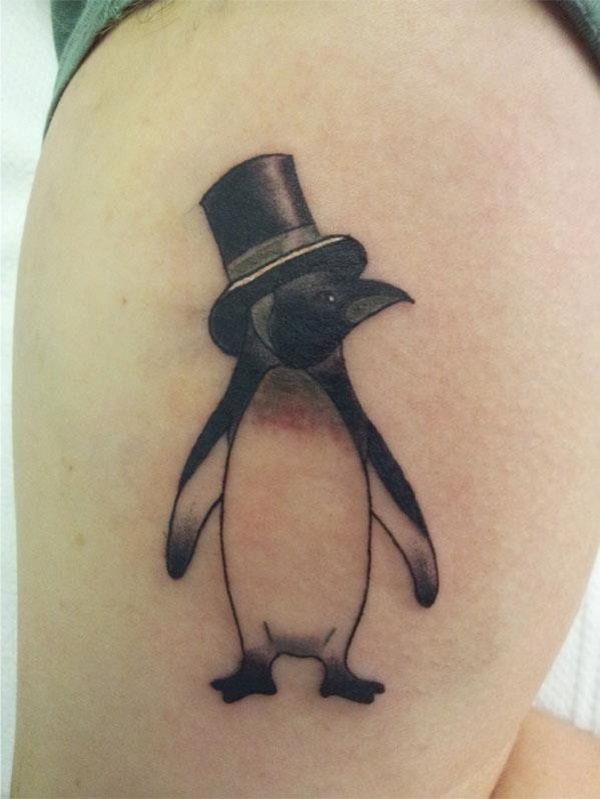 This tattoo, located on the wearer’s thigh, illustrates an angry looking penguin wearing a top hat. 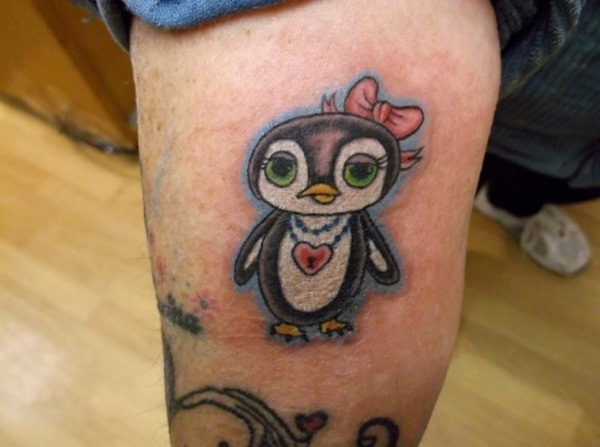 An adorable cartoon style penguin is pictured with a heart shaped necklace and bow on the wearer’s upper leg. 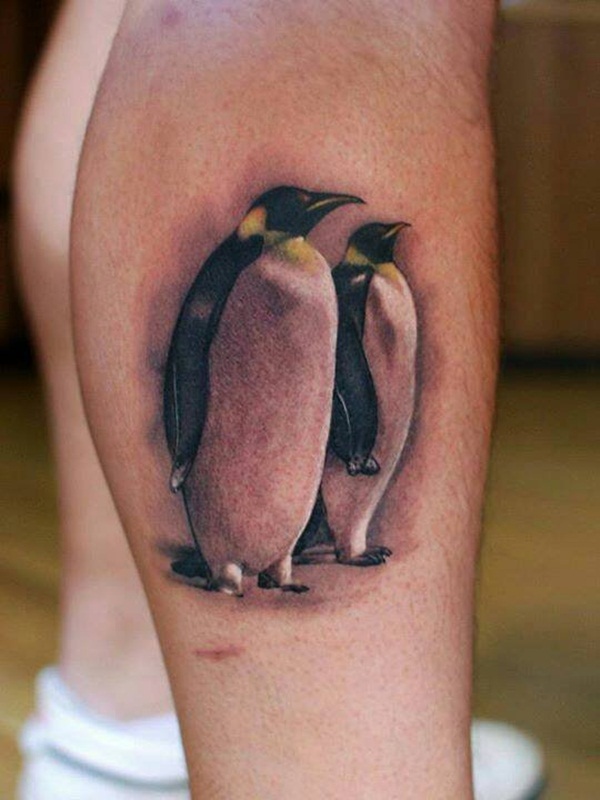 Impeccable shading creates the realism seen in this tattoo of a pair of penguins standing beside one another. 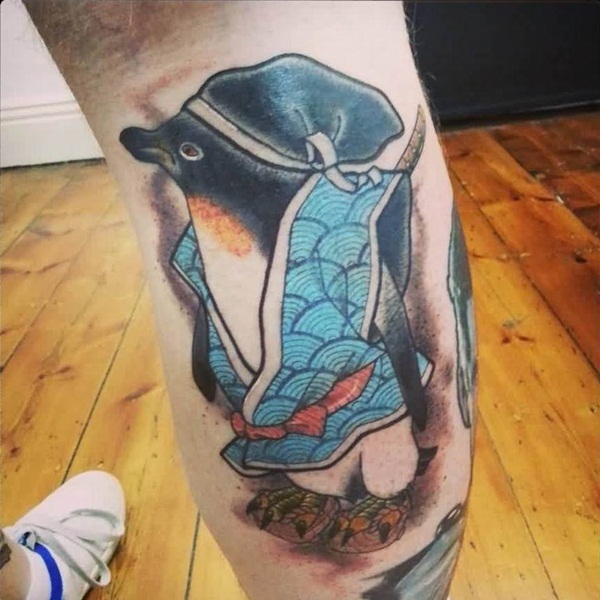 A penguin carrying a katana while wearing traditional Japanese clothing is illustrated on the wearer’s calf. 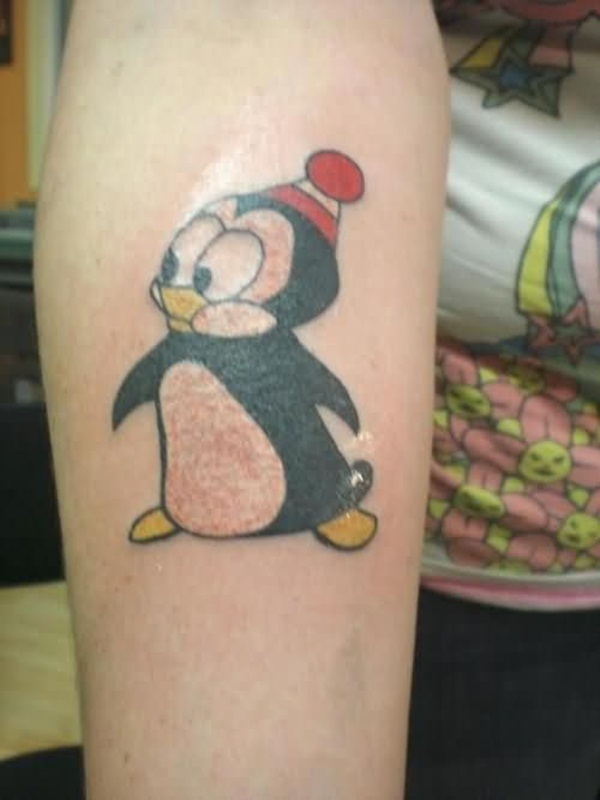 A cartoon style penguin with yellow beak and feet is portrayed wearing a red and white beanie in this tattoo. 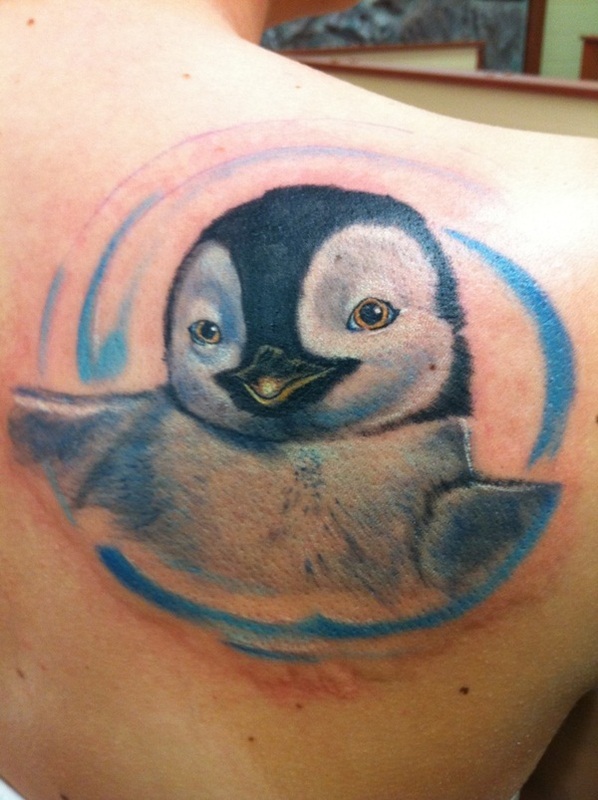 A portrait of the penguin from the popular children’s movie, Happy Feet, in seen in this tattoo located on the wearer’s back. 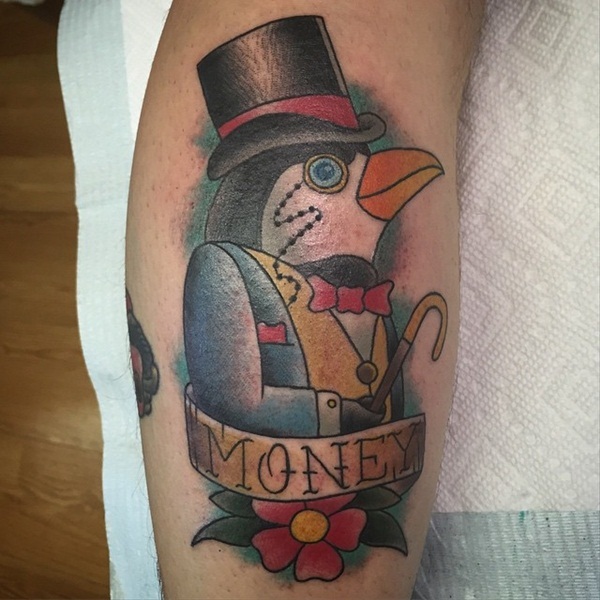 This abstract piece uses subtle hints of blue to color the piece while portraying a penguin wearing a top hat pierced with fish bone, a monocle attached to a heart on a string, and holding a cane emitting electricity from a bulb. 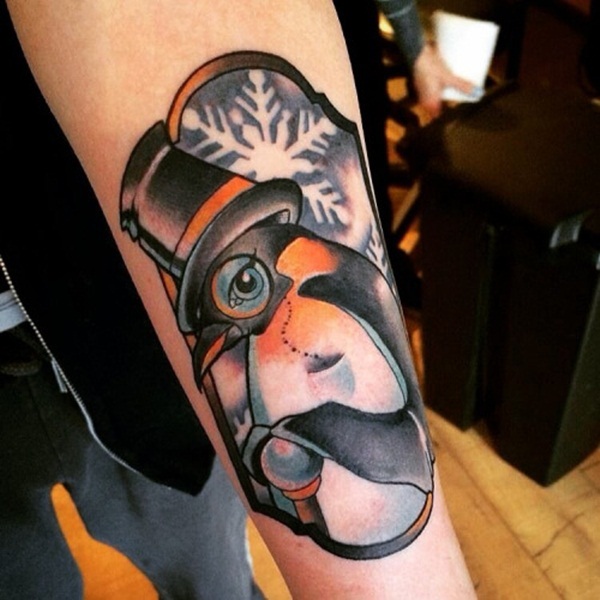 This high contrast piece depicts a simplified version of a penguin on the wearer’s torso. 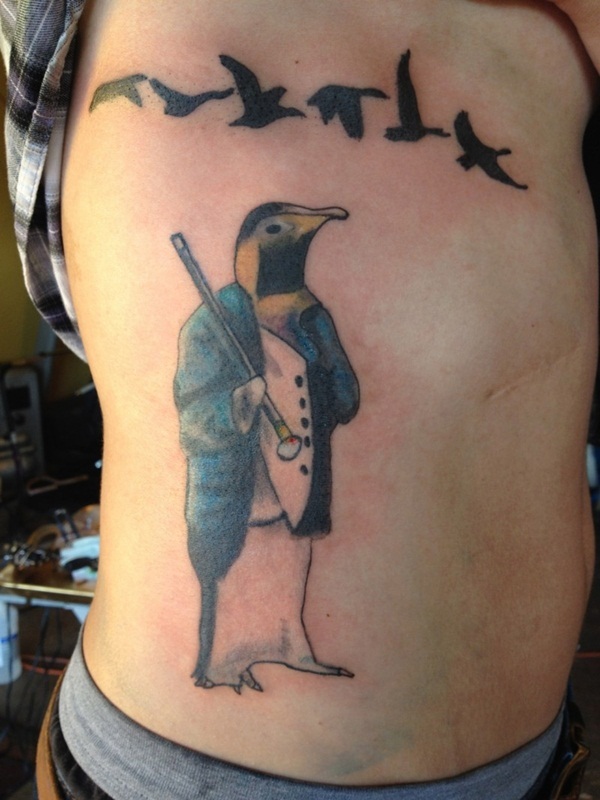 An ornate design comprises the black section of the penguin’s body in this tattoo rendered on the wearer’s chest. 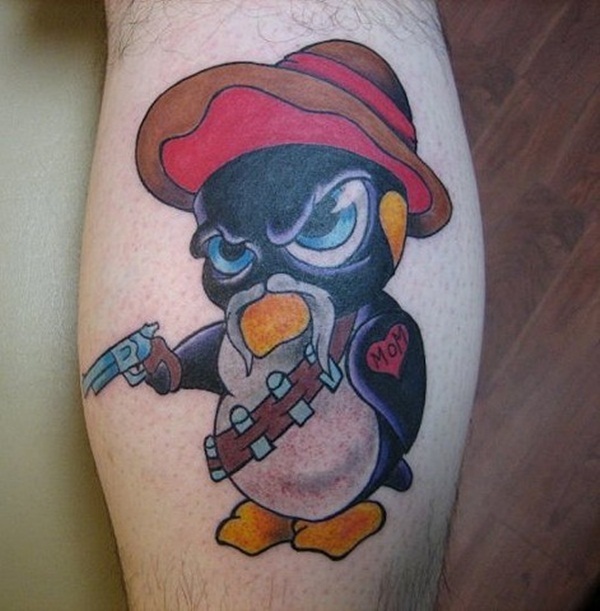 This tattoo, pictured on the wearer’s calf, features a bandit-style penguin. 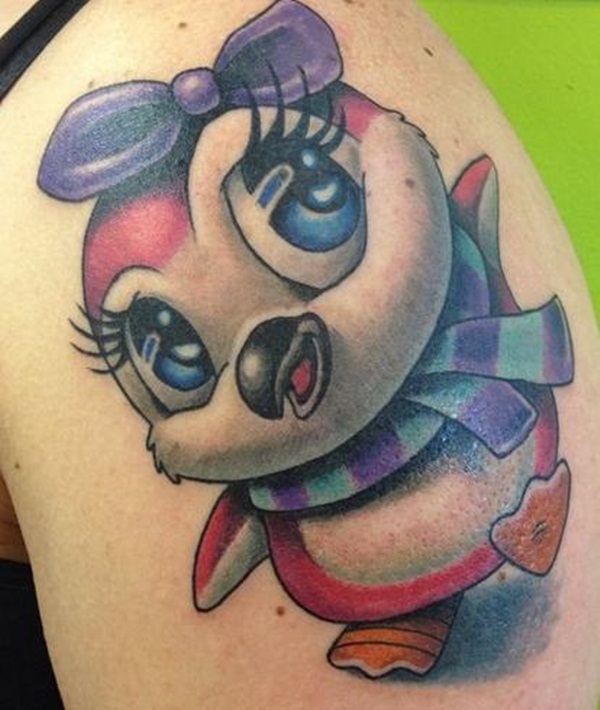 The penguin is embellished with a handlebar mustache, heart shaped mom tattoo, pistol, bandolier, and sombrero. 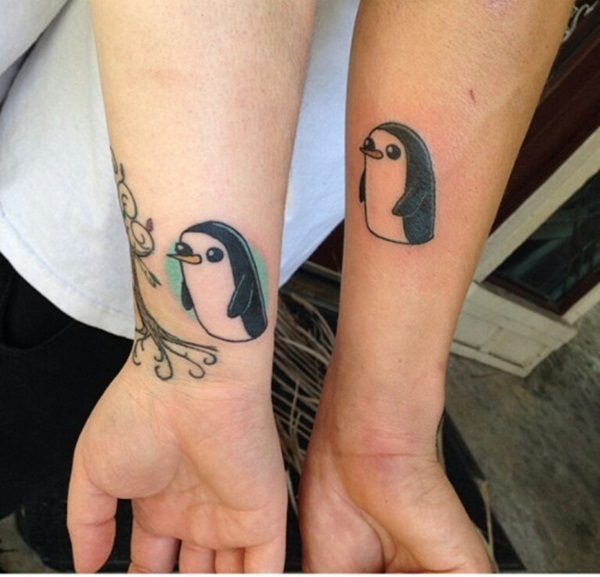 Once again we see a reference to the popular cartoon, Adventure Time, as Gunther is illustrated on the forearms of two different wearer’s in this tattoo set. 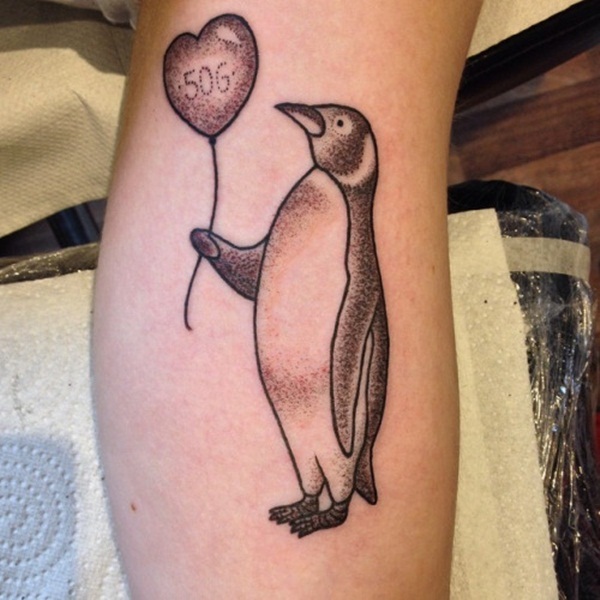 This tattoo pictures a penguin holding a balloon reading, “506.” The tattoo uses pointillism dots in lieu of traditional shading and distinguishes the images from one another using bold outlines. 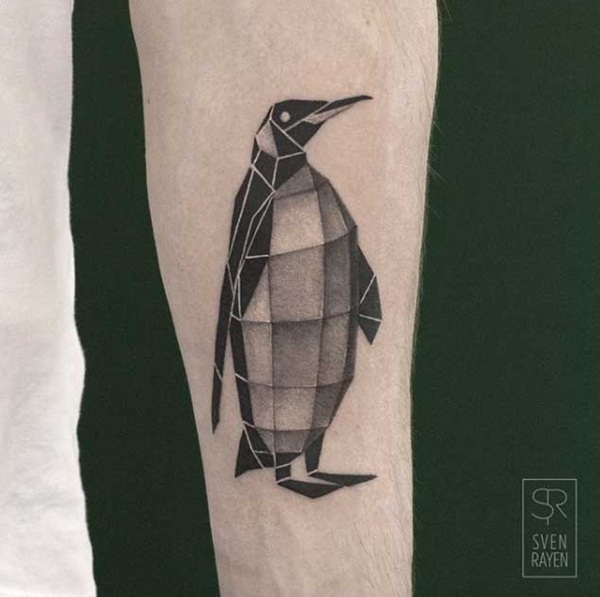 This black and gray tattoo, rendered on the wearer’s forearm, features an origami penguin covered in an elaborate design. 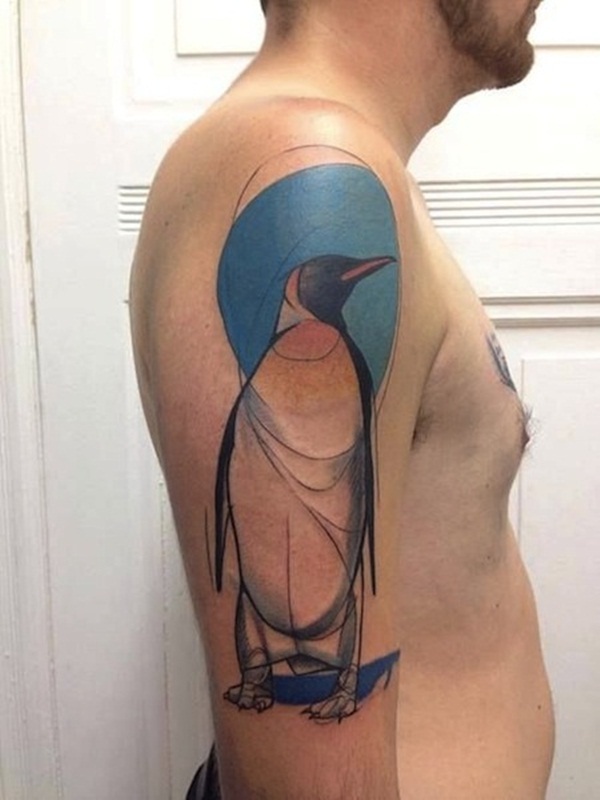 While the shading and negative space are used to create the pattern on the dark part of the penguin, precise line work is used to create the pattern on the white section of the bird. 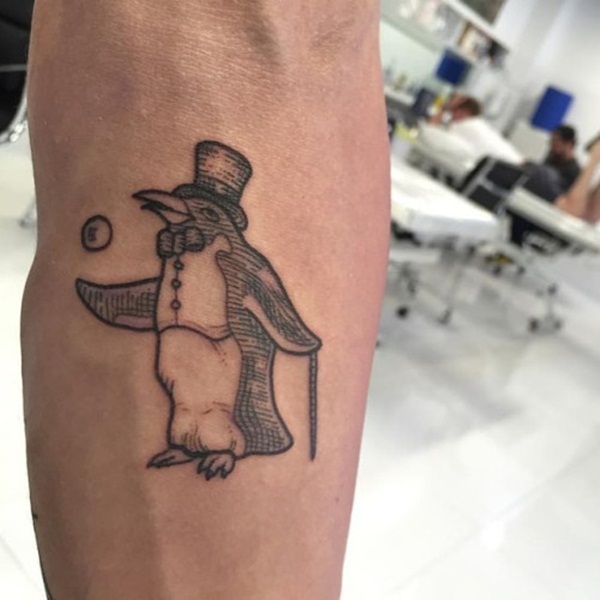 Reminiscent of old scrimshaw, this black and gray tattoo features a tuxedo and top hat wearing penguin tossing a ball into the air with one hand and utilizing a cane with the other. 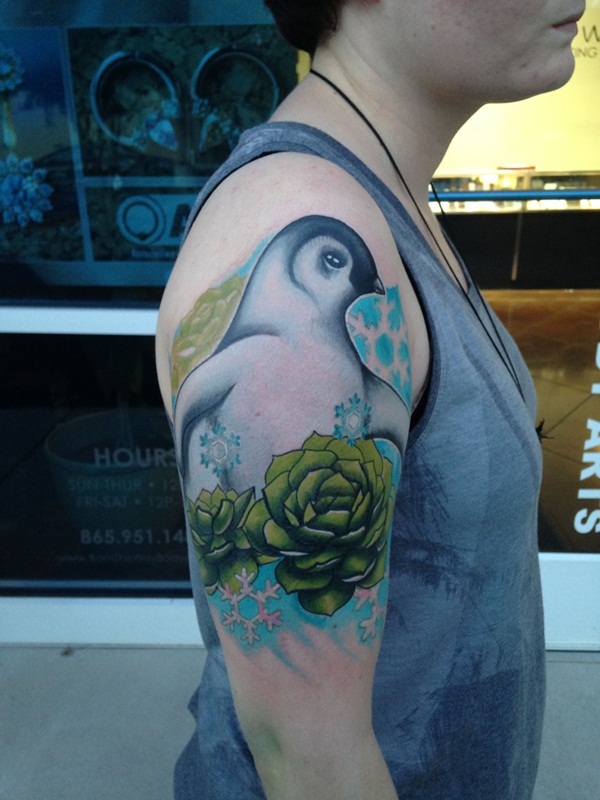 This tattoo, located on the wearer’s upper arm, heavily utilizes a palette of blue and green to create the image of a penguin accented by lotus flowers and snow flakes. 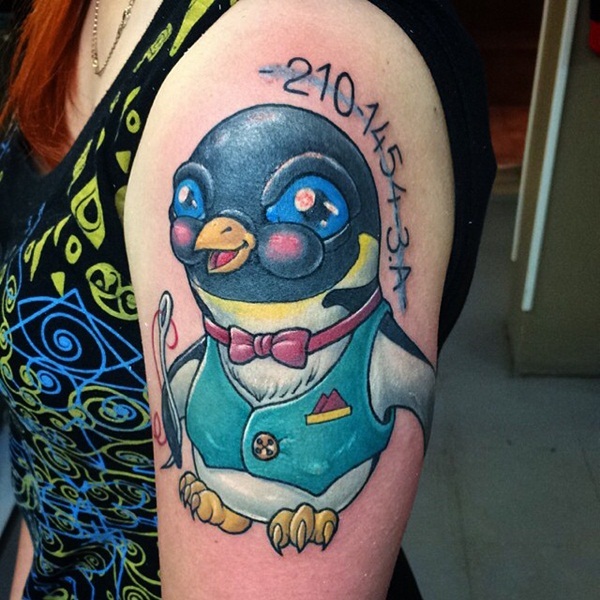 A monocled, cane wielding, top hat wearing penguin is illustrated in full color within the frame of a portrait in this tattoo rendered on the wearer’s forearm. 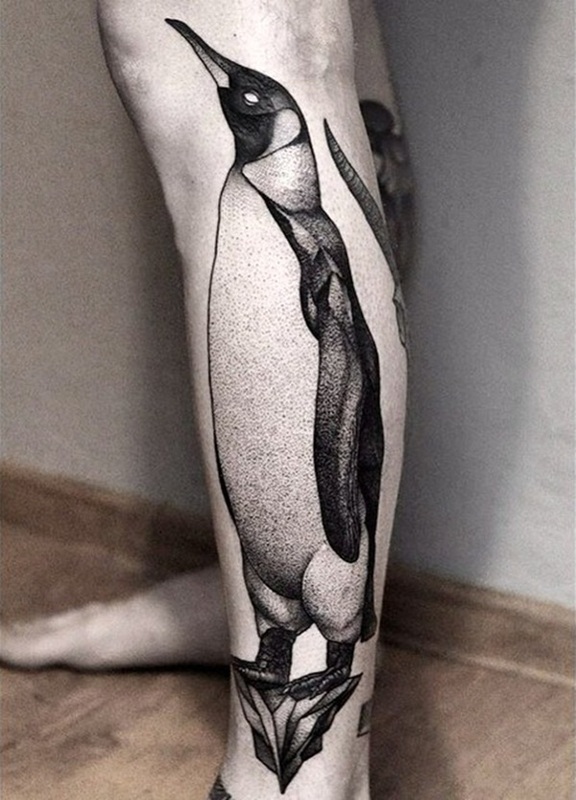 A fragmented penguin is portrayed in black and gray ink on the wearer’s thigh in this tattoo. Contrasting sections of the piece are colored using pointillism techniques while other sections are colored using cross hatching. 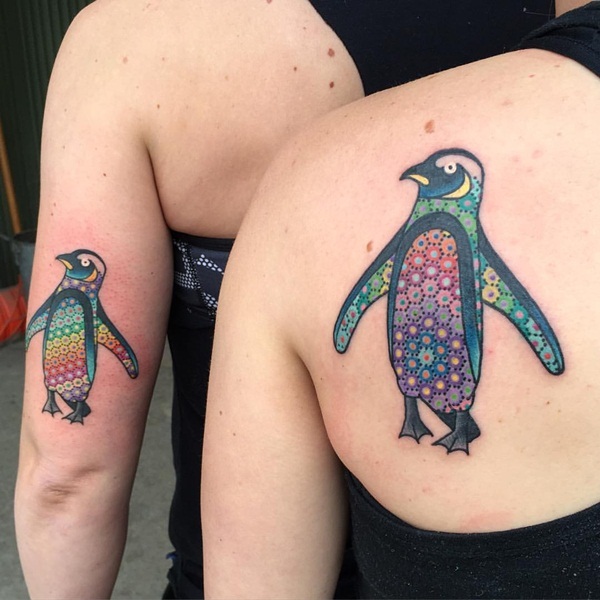 Multi-colored hexagonal patterns are used to enliven two portraits of angry looking penguins in this tattoo set.